Originally issued as Legrand Jazz (Columbia CS-8079). On the cover: Michel Legrand recording the soundtrack for the film Les Demoiselles de Rochefort, Paris, March 28, 1966. "The Jean-Pierre Leloir Collection. Created to pay homage to Jean Pierre Leloir’s work, the Jazz Images collection combines two of his passions: Jazz & Photography. Consisting on 50 lavishly edited LPs, all gatefold and pressed in 180 gram virgin vinyl carefully protected by audiophile inner sleeves." "Jean Pierre Leloir was the most important photographer covering France’s musical scene during the 50’s, 60’s and 70’s. Hard work and talent made an explosive combination: he did an in-depth coverage of the artists on stage and also built a unique body of work capturing them on their intimacy. 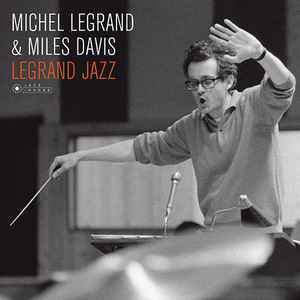 To pay homage to Leloir’s work, Jazz Images has selected the most important classic jazz albums to match with his visual genius. The result is this groundbreaking collection consisting of 50 LPs and 50 CDs, beautifully presented all in fold open editions, showcasing the photographer’s work as the common denominator."